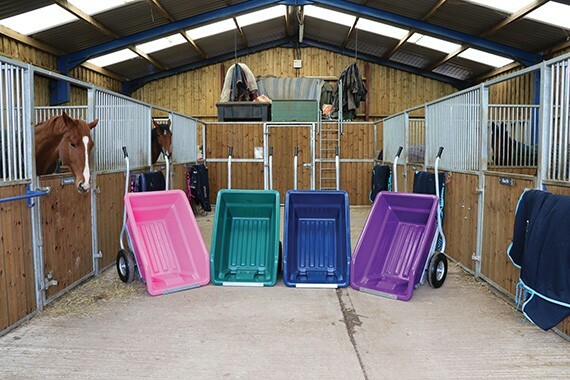 Now the weather has cooled down and there is more mucking out to be done, it is the perfect time to invest in a new wheelbarrow to assist you through the Winter months. Available in blue, pink, purple and green, this wheel barrow is twin wheeled and can hold 250 litres. This wheel barrow is fitted with a galvanised metal frame and roller bearing pneumatic wheels to deliver superior manoeuvrability and smooth handling. It is tough, durable and surprisingly lightweight in use. We are pleased to be able to offer this innovative wheel barrow to our customers, for a special price of £190 +VAT if purchased in November or December 2018.